This was something I’ve always wanted. Someone to tell me which roads to take and which not to take based on live traffic conditions. And just a few days ago, Google came to the rescue with Google traffic. My daily drive to work and back is a 70-km round trip from South Delhi to Noida and back – a journey that takes an hour each way and sometimes more. Over the last few years I have tried different routes at different times of the day to avoid traffic congestion on arterial roads. But somehow, they all eventually fill up with traffic, just when you are in a hurry. I also love toys and a GPS device is one of them. But ever since I began using an android phone, I’ve found GPS devices almost redundant, as my phone has always been able to pinpoint routes for me. And now it’s gotten even better. Google is offering free turn-by-turn voice navigation on Google Maps for android phones and better still – the icing on the cake – live traffic updates, which are really good. A couple of days ago, I was in a rush to get from Noida to South Delhi at 6.30 pm – the worst time of the day to be on the road. I had a driver with me and decided to make the most of my passenger time (I’m a bad passenger otherwise) by instructing him to take the route with the least traffic congestion. This was as good a time as any to try out Google Maps with the Live Traffic layer feature. And yes, all us Android users are responsible for making this feature better. Here’s how. All Android phone users who have “location-based services” enabled on their Android phones are helping Google collate the data based on your movements. If you switch on, Google Maps, Google Latitude, mobile tracker, or “update my location” on your browser, Google will be able to track your movements anonymously using GPRS triangulation (cell-tower data) and GPS, if you have it switched on. Google then compares your speed with the relative speed of other Android users on the road, across many handsets in the city at any point in time. 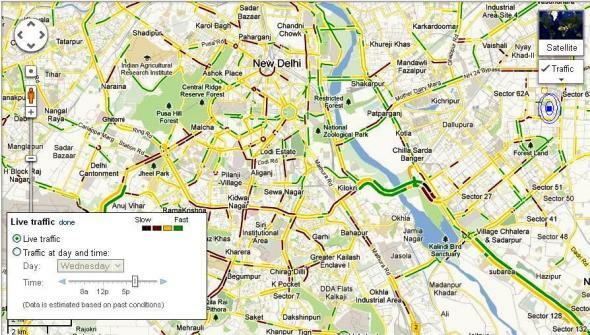 This gives Google a pretty clear picture of the kind of traffic conditions prevailing in the area. This data is then beamed back to your phone or to a web browser running Google maps as live traffic updates on Google Maps and is refreshed every few minutes. Google says, it takes zero effort on the part of the user – all one needs to do is switch on Google maps on your Android phone and let it run in the background. The more Android users who do this, the more accurate the maps become. Traffic shows up as green lines for smooth flowing traffic, orange lines for moderately heavy traffic, red lines for heavy traffic and red and black blocks for traffic that’s at a standstill or barely moving. So far this feature is available only on Android phones. So all you Apple iPhone users out there, you’ll need to wait a while for this cool feature. It’s not appearing on your phones before December. And yes, these free features on Google Maps (Turn-by-turn voice navigation and live traffic) have the potential to make all standalone GPS devices redundant!